The Elstead Cromwell aged bronze cartwheel 5 light Gothic chandelier, hand finished in a unique aged bronze finish, with matching candle tubes and metal sconces. Part of a truly medieval style range hand-made in heavy wrought iron. Each piece is individually hand painted in a unique Old Bronze finish and has been designed and manufactured in Britain. Height adjustable at the time of fitting by removing chain links to suit, please see the technical information for exact dimensions. 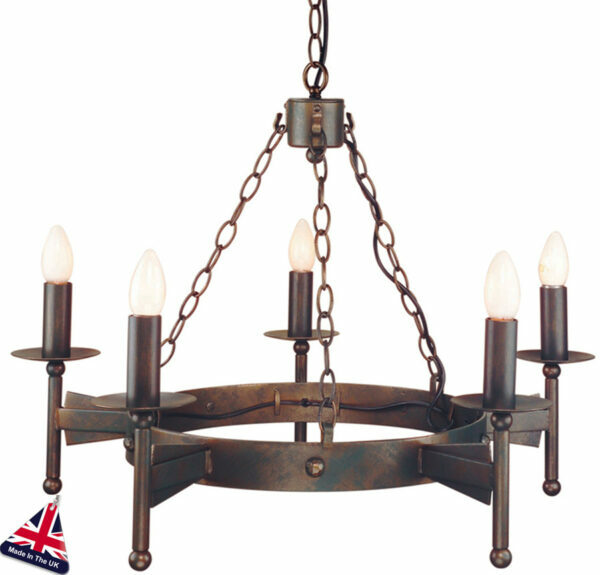 The Cromwell aged bronze cartwheel 5 light Gothic chandelier, designed and made in England by Elstead Lighting.